Between 1789 and 1802 France was racked by a revolution which radically changed the government, administration, military and culture of the nation as well as plunging Europe into a series of wars. France went from a largely feudal state under an absolutist monarch to a republic which executed the king and then to an empire under Napoleon Bonaparte. 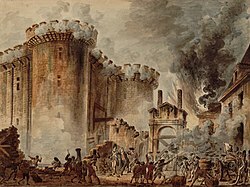 Although it only contained seven inmates, the storming of the Bastille on the morning of 14 July 1789 was the flash point for the French Revolution, The Bastille, a medieval fortress and prison represented Royal authority in Paris. On 21 May 1880, Benjamin Raspail proposed a law to have "the Republic choose the 14 July as a yearly national holiday". The ministry of the Interior recommended to Prefects that the day should be "celebrated with all the brilliance that the local resources allow".